of Pharmacy and Technology Management Professor/Associate Professor/Assistant Professor. 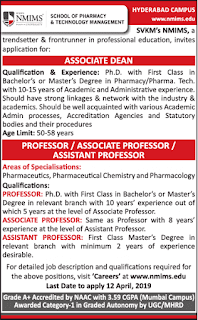 They prefered Teaching Experienced candidates for Professor/Associate Professor/Assistant Professor Posts. Refer the official website www.nmims.edu for more information about NMIMS’s School of Pharmacy and Technology Management Jobs. Salary, selection procedure, how to apply and important dates, are given below. 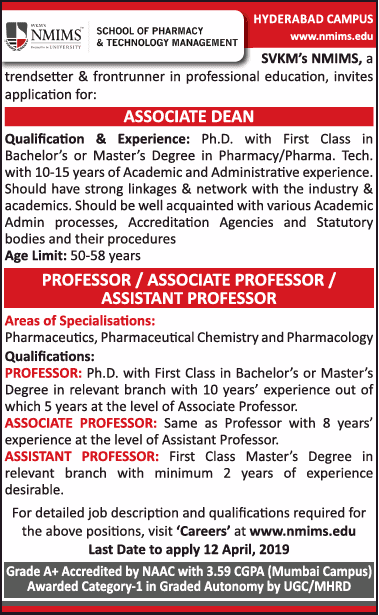 Professor/Associate Professor/Assistant Professor Jobs in NMIMS’s School of Pharmacy and Technology Management. NMIMS’s School of Pharmacy and Technology Management. Starting date to apply for NMIMS Assistant Professor Jobs: 08-04-2019. Ending date to apply for NMIMS Assistant Professor Jobs: 12-04-2019. Professor: Ph.D. with first class in Bachelor’s or Master’s Degree in relevant branch with 10 years Experience out of which 5 years at level of Associate Professor. Assistant Professor: First Class Masters Degree in relevant branch with minimum 2 Years of experience desirable.